It’s no secret the New Jersey Devils have a glaring need for a strong left-handed defenseman; there’s only so much Andy Greene can provide. Can Calvin De Haan, unrestricted free agent come July 1, be that guy the Devils can start to give more minutes in that regard? Probably not, but he might be good enough to take some pressure off Greene. A rather safe player, De Haan is a great skater that would fit well into the Devils’ system with strong puck moving abilities in transition. Since the 2014-2015 season De Haan has played in 252 games and around 4300 minutes for the Islanders. In that time, he is one of three defenseman to boast a corsi for above 50 percent at even strength (the other two being Visnovsky and Davidson, who’s only played in 15 games for the Islanders) at 50.18 percent (all stats via corsica.hockey). That might not seem overly incredible but considering how notoriously bad the Islanders have been defensively the past few seasons, this is quite the feat. De Haan’s 2017-2018 season was derailed due to injuries, limiting him to dressing in 33 games total. Over that time, he ranked third on the Islanders (second if we remove Davidson and his 15 games with the team) in corsi for at 49.23 percent, only 0.1 behind Pulock for the team lead. De Haan may not be a big time point producer with a career point percentage 0.266, but that shouldn’t be much of a concern for the Devils as he rarely gets powerplay time and is more of a safe defenseman. In fact, he may be a great supplement to Severson as being the defensive-minded player on that pairing, while also being able to transition the puck up ice well and join the rush with his strong skating. Sean Tierney does a fantastic job at creating these visuals, along with Cory Sznajder who collects the data, and this is another great example. This graph compares defensemen’s efficiency at both exiting their zone with possession and stopping the opposition from entering the defensive zone. What I love to hone in on here is the possession exit percentage, as that plays such a massive role in the Devils’ system of quick and efficient transition play – exiting the zone with the puck is crucial. 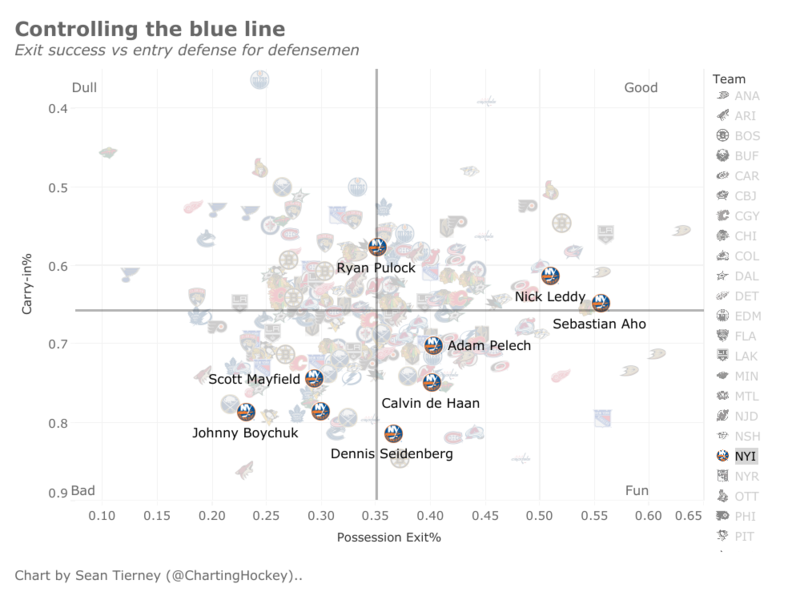 De Haan is fourth on the Islanders in possession exit percentage at 0.4014. In terms of bringing that to an easier-to-digest perspective, he would have ranked third on the Devils only behind Mueller (0.4348) and Butcher (0.4867) – two defensemen who are strong on that transition style of play, but are also left-handed defensemen. If the Devils were to pursue De Haan, it would be his efficient transitional play they are after and the rationale behind him being a good fit with the team. Going back to Butcher and Mueller, let’s look at how De Haan might fit in with the Devils (assuming Moore doesn’t re-sign). Like I said previously, I think De Haan would be a great compliment with Severson as they both are strong in transition, but De Haan is more responsible defensively and could give Severson a longer leash to pursue his offensive-minded ventures. The X-factors here are Mueller and Butcher as I think Butcher is ready for more responsibility. In terms of contract, De Haan “picked” the wrong season to suffer a season-ending injury. He was looking good up until that point, but will not probably suffer as a result. Realistically, I could see the Devils offering him three years at around $2-$3.5M per season, which would be more than fair. De Haan is only 27-years old so in that respect, it wouldn’t be much of a risk. The team does have cap space to burn right now, so that contract wouldn’t cripple them now or when players like Nico Hischier and Taylor Hall need new contracts. In conclusion, I’d say the Devils should pursue De Haan as a safety net option. He can be a good second pairing defensman that’s able to take some tough minutes off Greene, while also fitting well into the Devils’ system. If there are stronger left-handed defenseman available via trade, then those might be a priority but in terms of free agent signings, De Haan is a good low-risk option.